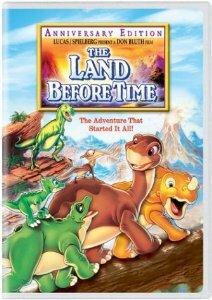 The Land Before Time On DVD Only $5 + FREE Shipping! You are here: Home / Great Deals / Amazon Deals / The Land Before Time On DVD Only $5 + FREE Shipping! Oh, you guys, The Land Before Time was one of my FAVORITE movies when I was younger, so I am SO excited to see this deal – Amazon has The Land Before Time Anniversary Edition on DVD for just $5, down from $9.99! Shipping is FREE with Amazon Prime or Super Saver Shipping! I remember getting the dinosaur hand puppets from Pizza Hut – such fun memories! And, now I can share the movie with my daughter! I can’t wait – I know she’ll love it!